Today's Look: celebrates the first snow of the season and excitement of the holidays. The wind was chilly and the air was crisp, so I wanted to bundle up, but not totally Eskimo-style. First, I chose the army green, bomber jacket. The material is soft yet thick, meaning the wind doesn't slice right through it. Next, I chose the black, felt-insulated jeggings and brown, lace-up boots. Since the jacket isn't tight, I wanted the pants to be slimming and warm. I liked the boots because brown with green is a classic combination, and the boots are a nice faux-leather which helps them be durable in the snow. To match the brown boots, I chose a brown backpack. Finishing off the look, I wore an army green, knit beanie, off-white scarf, sparkly green/tarnished gold earrings, and two rings. Outfit Details: Jacket, Boots, & Backpack c/o Charlotte Russe ❤, Jeggings by Hue at Dillard's (Prescott, Arizona), Beanie by D&Y at Basement Marketplace (Flagstaff, Arizona), Scarf at Urban Outfitters (Tucson, Arizona), Earrings by Decree at JCPenney (Prescott, Arizona), Rings from Aeropostale (Scottsdale, Arizona). 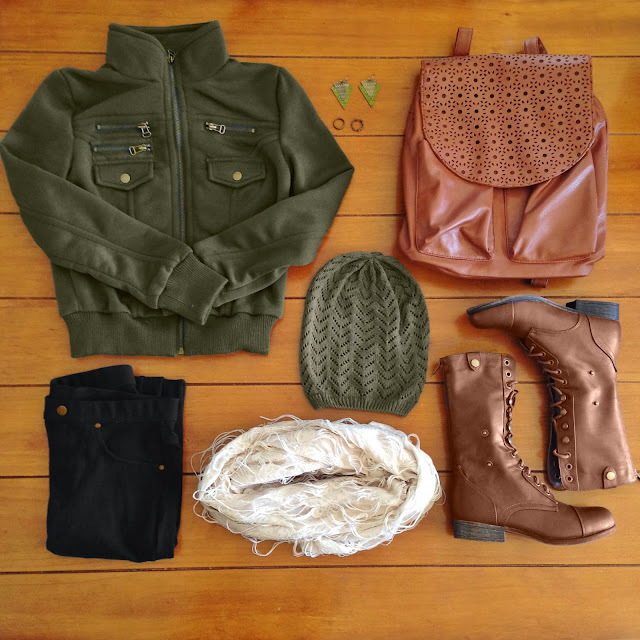 Fashion Tip: Items, such as beanies, jackets, jeans, boots. scarves, etc., in army green are stealing the scene this winter. The trend is a MAJOR must this season. More ideas on how to rock green jackets this winter. Outfit links found here.